Well, good morning and happy Thursday! 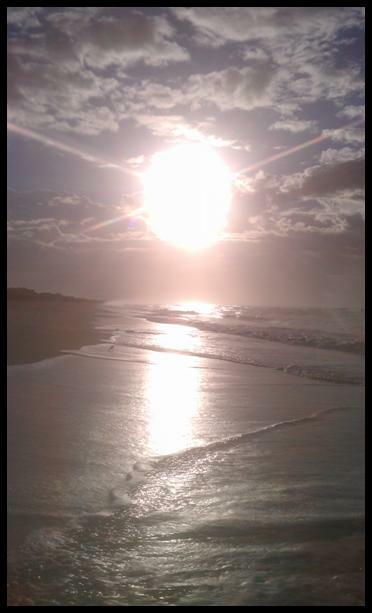 I’m heading to the beach on Saturday morning for my annual beach trip with friends. I’m pretty excited about the trip, but it’s come at a hectic time in my life, so it’s hard to not be stressed about everything I’m leaving behind — wedding planning, getting the new house together, and work. But, I’m going to try to relax and enjoy the trip! If you’ve been reading for a while (or you know me), you’ll know that this trip is when Zach proposed to me last year, so it will be fun to celebrate the one year anniversary of our engagement at the beach before our wedding next month (!!!). That sliced tomato wasn’t too shabby either. 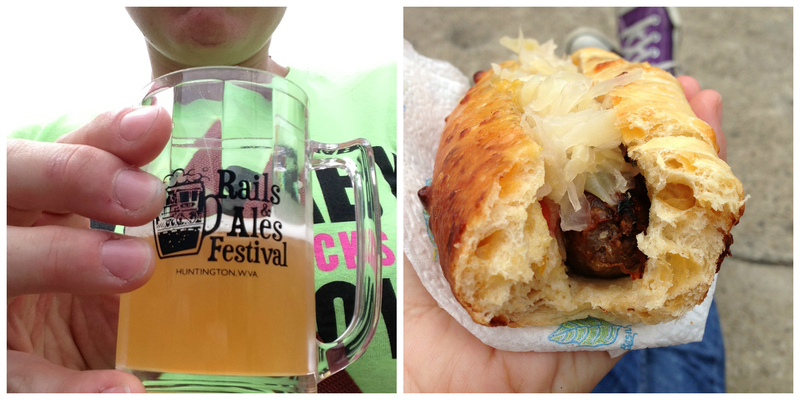 Last weekend, after the Crossfit competition, Zach and I went to the first “Rails and Ales Festival” here in Huntington. This is the first time they’ve had a beer festival in downtown Huntington, and it was so fun! When we entered, they gave us a tiny beer mug to sample all the beers. There were also tons of food vendors around, and we couldn’t really decide what to eat until we ran into a friend who had a brat sandwich on this amazing looking bread from the local bakery. We hightailed it over there, and it was one of the best sandwiches I’ve tasted. It had kraut, hot pepper jelly and was served on this amazing homemade cheddar bread. Yum! I’ve never made these before, but after I tasted them, I instantly decided that this would be what I made for everyone at the beach (we all take turns cooking dinner). Holy amazing and easy to make!! I basically just brushed the fish with butter and sprinkled it with my favorite spice blend (Bobby Flay’s 16 spice rub — minus the cinnamon and brown sugar) and broiled it until it was flaky. Then I threw a couple tortillas under the broiler for a few seconds on each side, chopped up some tomatoes, avocado, lettuce and cilantro and served. No salsa necessary (although a nice creme fraiche would probably be nice on top) and it was amazing. 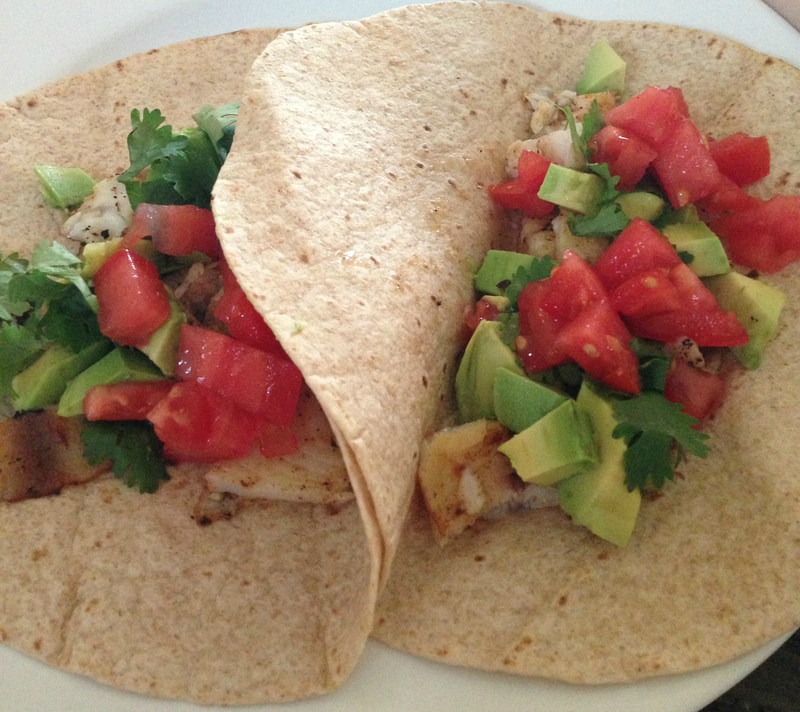 I didn’t have any corn tortillas, but next time I’ll use them instead of whole wheat. Yum! 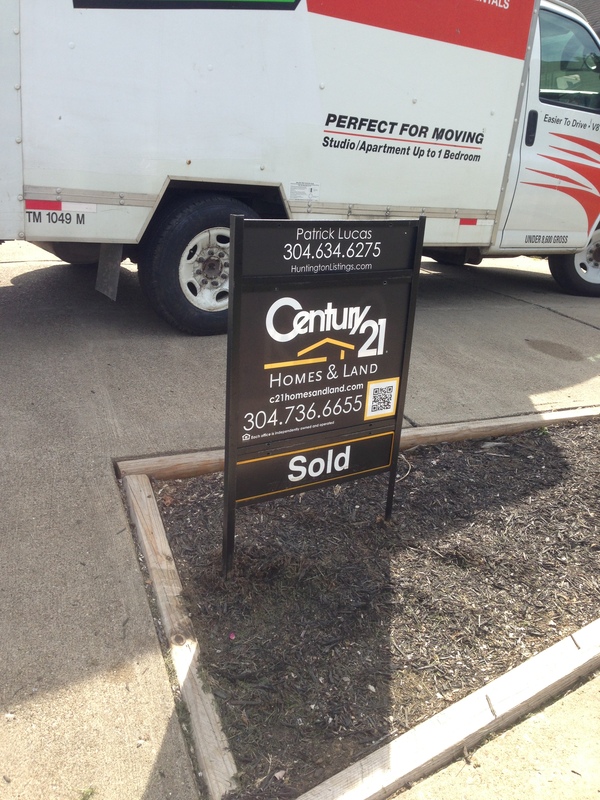 We finally moved into our new home! Last Thursday, we rented a Uhaul and loaded up our little crowded apartment, and with some help from friends (Thanks, Mandee and Susie!!) got everything in and our apartment cleaned out in two days. 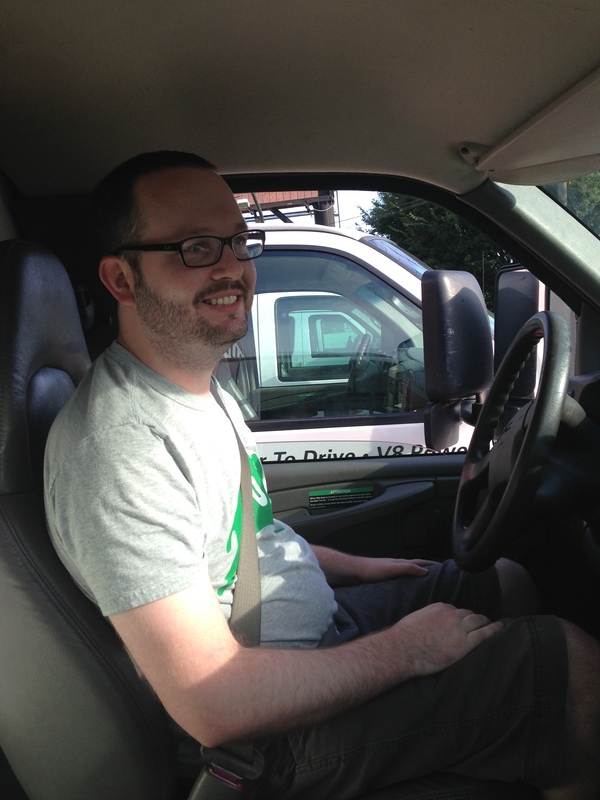 Zach had to drive the Uhaul and smile when I took photos. View from the front door. 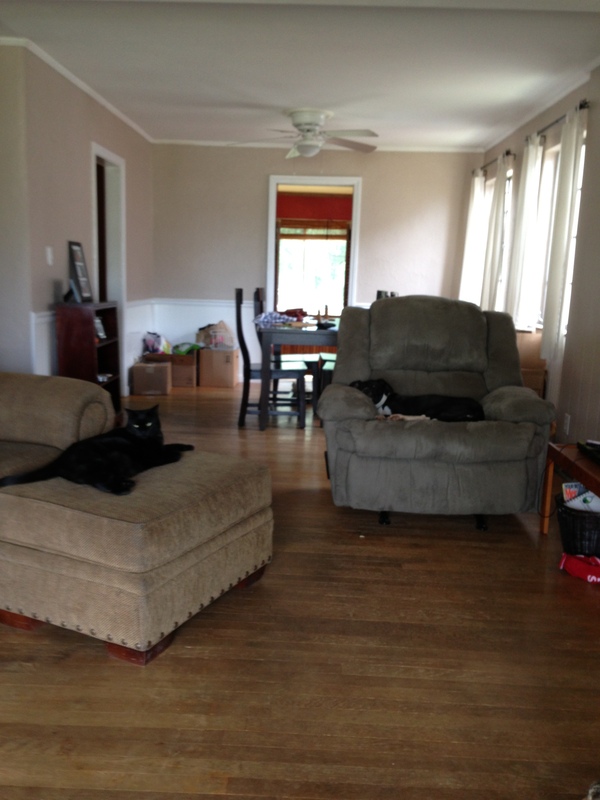 You can see a couple freeloaders have made themselves quite at home. Seriously, every evening! I’m going to miss this when I come home from work after it’s already dark. The one thing I’m not too crazy about is the lack of sidewalks around my neighborhood. Frank and I are big fans of our morning walk, and it’s kind of dicey because a lot of times we have to walk in the street because of the lack of a sidewalk. It also turns out that our street is way busier (especially in the morning) than we thought it would be, because we are right behind the hospital and it seems that the people who work at the rehab center behind the hospital use our street as a through way to get to work. That wouldn’t be so bad, but they go a little fast. I’ve already found myself getting very angry at people who speed up our hill in the mornings. I’m possibly going to contact somebody to see if there is something we can do about getting people to slow down on our street. Maybe that seems silly, but eventually we will have kids, and I would like to walk our kid to school (the elementary school is just down the hill). Right now, it’s a little too dangerous to do that. Does anyone have any suggestions how to go about getting people to slow down in a residential area? 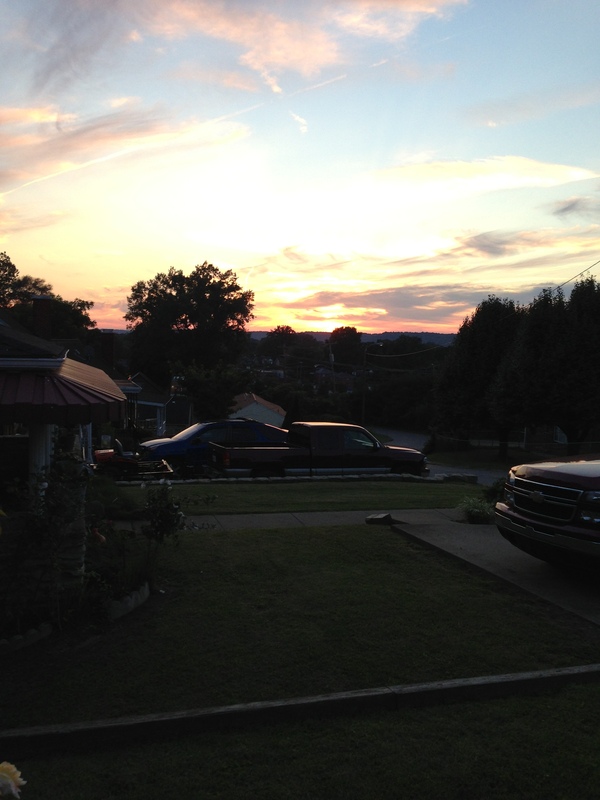 However, the one thing I do like about walking around our neighborhood is the hills! We are definitely getting more of a workout during our morning walk because of all the hills. I just wish the neighborhood were more walk-friendly. I’ve definitely been inspired by the Crossfit Competition I participated in last week to really push myself to up my weights at Crossfit. This morning we did the second Open WOD for the WV Crossfit Championship (which I’m not registered for, but it’s still fun to try the WODs). I ended up getting through the 9 lifts at 75#, which was very tough for me. 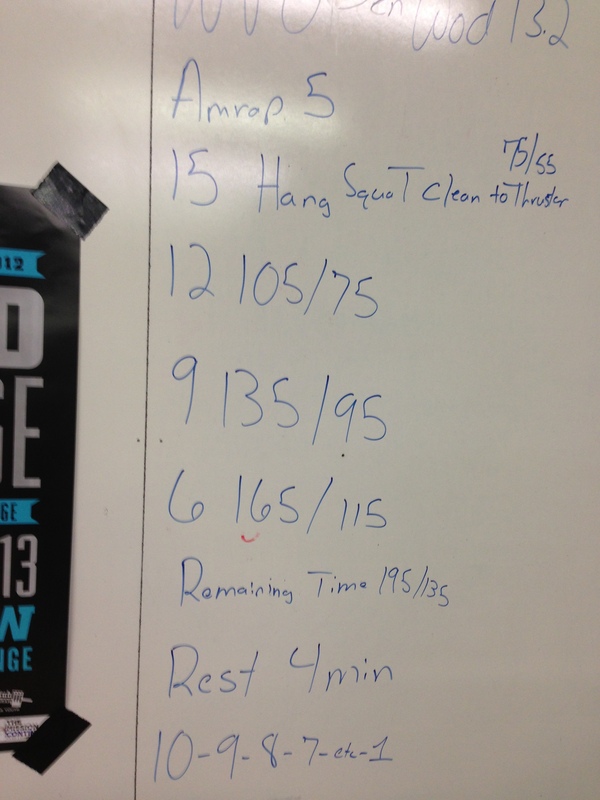 That’s the most I’ve ever done for that lift, and I was proud of my performance. 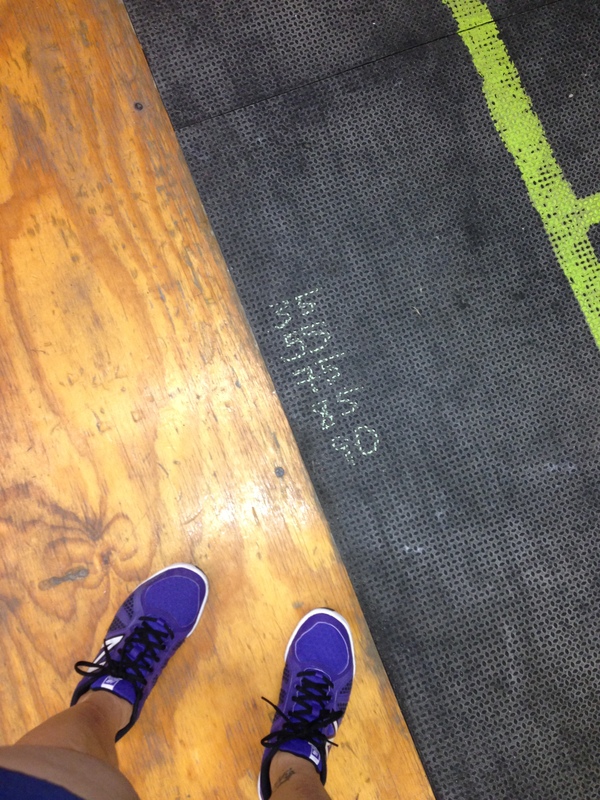 Oh, and in case you are wondering, the 10-9-8….3-2-1 was for burpees, sit ups and push ups. That was a tough one! Like I said, next week I’ll be at the beach, but I didn’t want to take a full week off of Crossfit, so I scheduled a drop in at the local box in Ocean Isle. Despite being new to Crossfit, I knew it was common to “drop in” to a box if you’re visiting somewhere, so I took a chance and located the local box. I contacted them and they were super nice and welcoming! It cost me $15 to do a drop in class at 9:00 AM on Monday, so I’ll be sure to report back how it went. Are you the type of person who works out while you’re on vacation? I personally love to work out while I’m on vacation. It’s a fun way to see the sights and since I’m not working, it is easier to find the time to get a workout in! 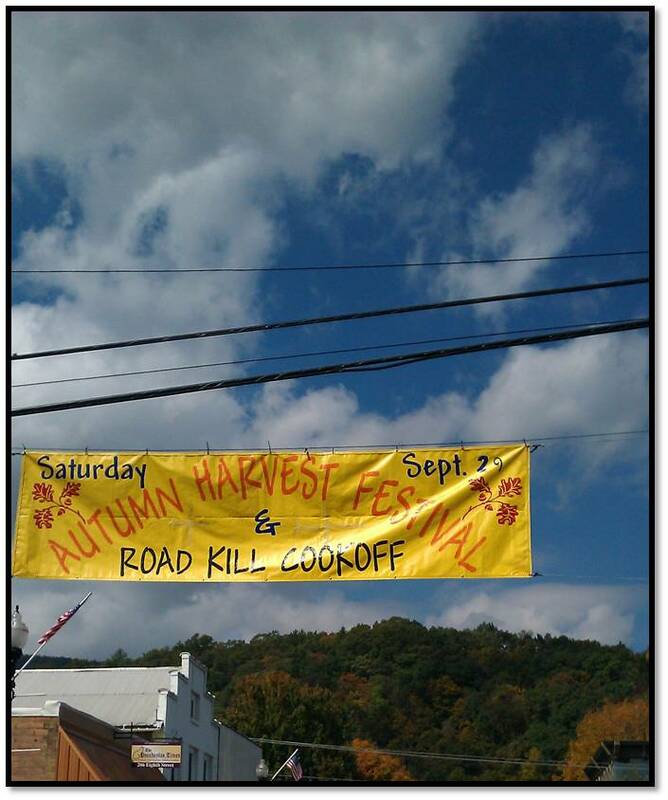 This weekend, Zach and I joined some friends for a trip to Marlinton, WV for their annual Fall Festival and “Roadkill Cook-off” — all of us had seen advertisements for the Festival when we’ve visited Pocahontas County, so our curiosity was peaked. Our friend Mandee’s husband Garrett’s family happens to have a cabin located right along the Greenbrier River and they invited us down to hang out at the cabin and check out the Festival. 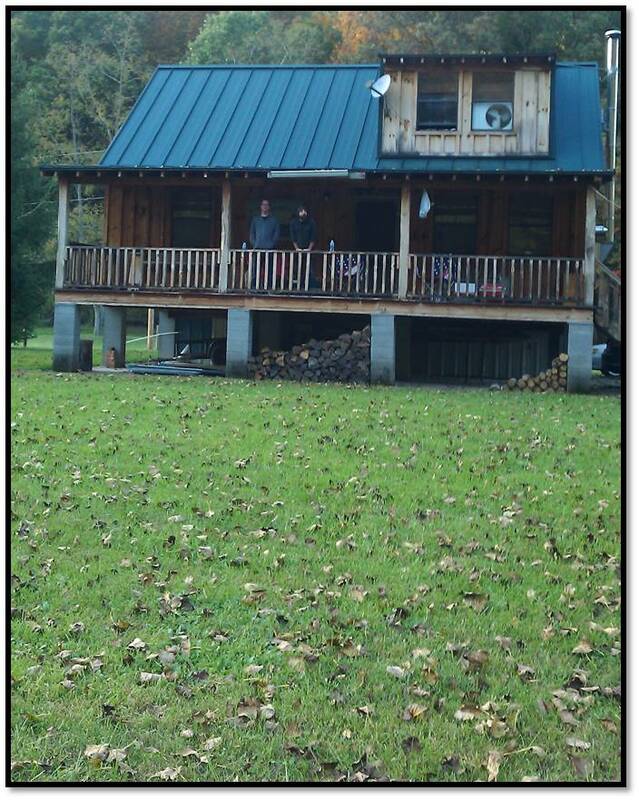 The cabin was great! All the comforts of home. We arrived on Friday evening and left Sunday morning, so minus our Roadkill Festival fare, we concluded that we would need three meals while we were there — dinner Friday, breakfast Saturday, and dinner on Saturday. So each couple was responsible for one meal. Mandee made us an excellent chili on Friday evening (I threw together a quickie cast-iron skillet cornbread also). I’m sad I didn’t take any photos, but I was ravenous and just inhaled it! I was responsible for breakfast Saturday morning. 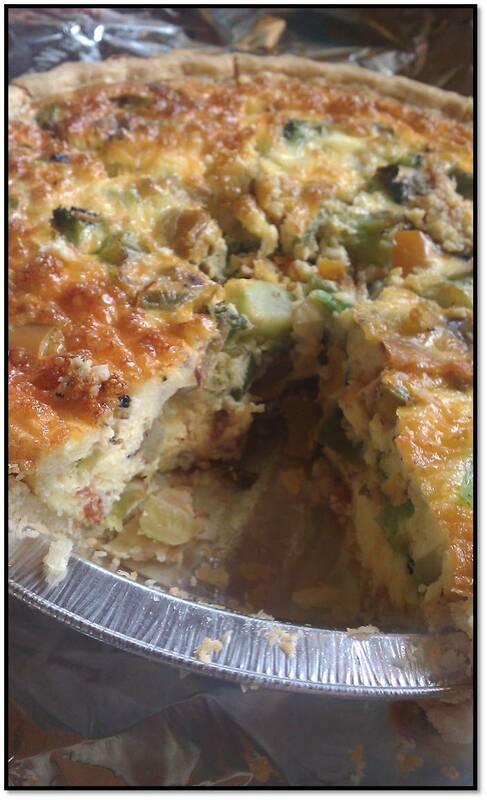 Since we were right on the Greenbrier River Trail, I wanted to get a run or two in, so I decided on a low-maintenance breakfast: quiche! Quiche is the easiest. You just crack some eggs, add in some cream, cheese and veggies then cook it until it’s not runny anymore. I even used a store-bought crust because I was going for quick and easy. 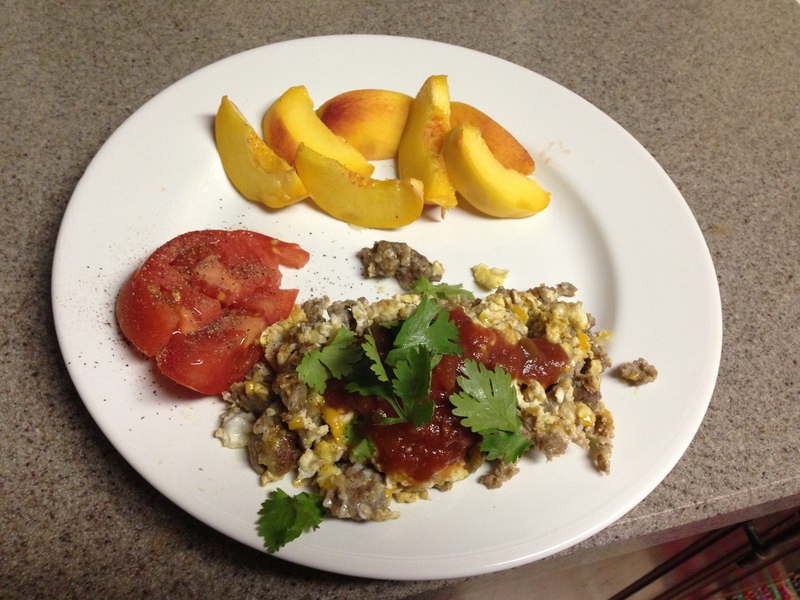 I love easy meals that are delicious and seem labor-intensive. This quiche turned out great. Usually I go the asparagus route with quiche, but this time I threw in some broccoli and peppers. It was very delicious. I made two, and we had plenty of leftovers to heat up and eat while we were packing up on Sunday morning. Speaking of running (was I? 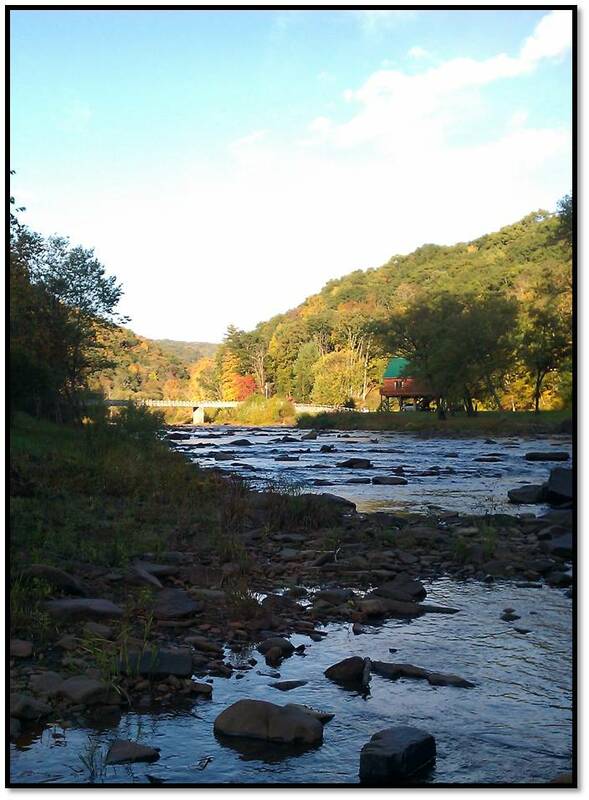 ), like I mentioned we were right on the Greenbrier River Trail. It’s a 78 mile trail that goes through the mountains of West Virginia, and it is breathtaking. On Saturday morning, I did a three-mile loop in one direction and then on Sunday I did a six-mile loop in the other direction. 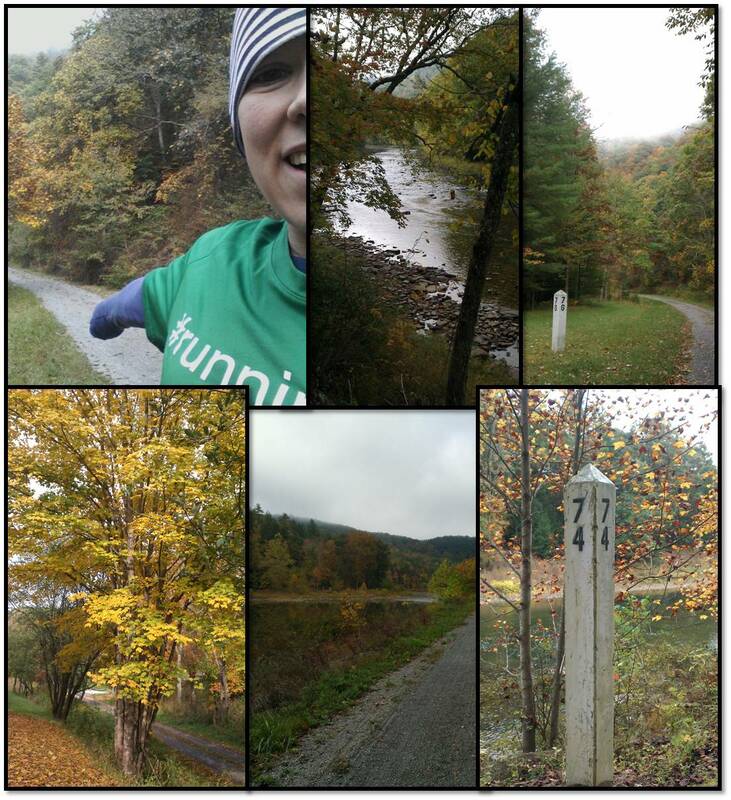 It was a really pretty run, and the weather was chilly enough that once I started sweating I was still comfortable. I must have stopped to take a million photos. 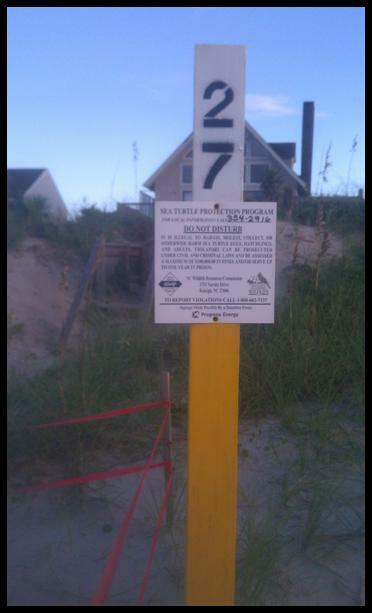 Our cabin was located on mile marker 77, so on my six mile loop I ran until I got to mile marker 74 and then turned around. I love running in the solitude and nature, but do not try to do it without music. When I run in town, there is plenty to keep my interest, but miles and miles of river and trees, while lovely, can get pretty repetitive pretty quickly. The first morning I realized that I forgot my headphones, hence the shorter run, but then on Sunday morning I realized I brought that hat you see on my head up there, which has built in headphones. Luckily it was chilly enough to run in a hat. 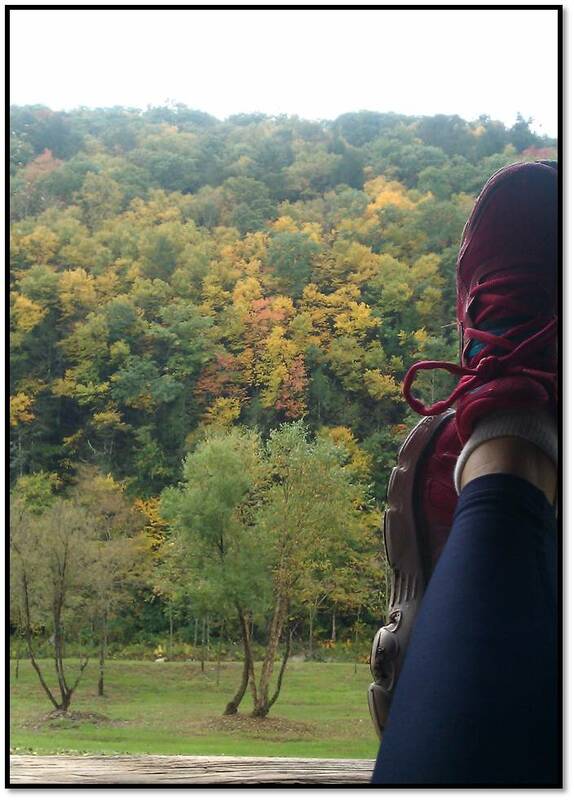 Enjoying the view from the cabin porch, post-run. Let’s talk about the Roadkill Cook-off, shall we? 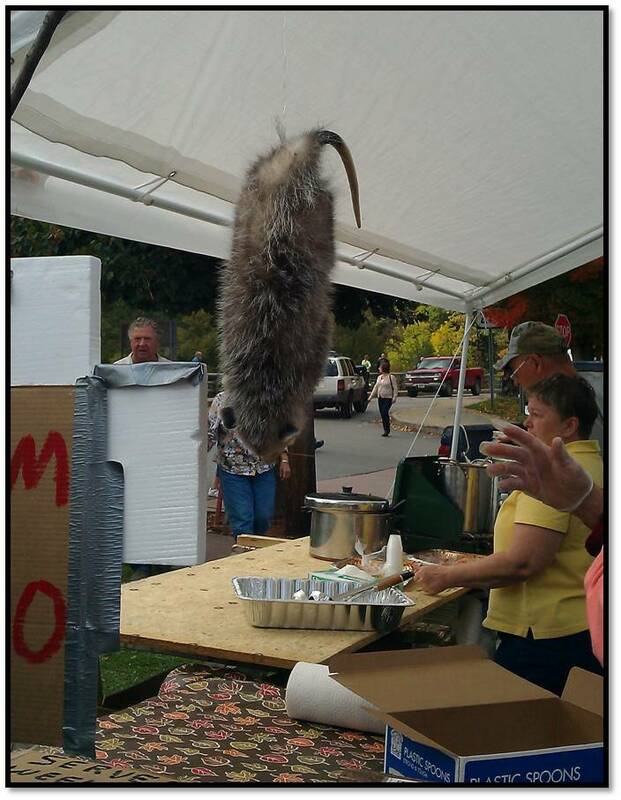 The Pocahontas County Autumn Harvest Festival and Roadkill Cook-off has been happening for 22 years now. The first rule listed in the WV Living Magazine article about it last year reads: The main ingredient must be any animal commonly found dead on the side of the road, including groundhog, possum, deer, rabbit, squirrel, or snake. Pigs, cows, chickens, horses, and goats are also acceptable. The animal need not actually come off the side of the road, and in fact, most of the judges prefer that it didn’t. I’ll have to admit, I was pretty nervous. I’ve been a vegetarian in the past, so going beyond my usual chicken or fish was a bit of a stretch for me. But, these are once in a lifetime opportunities, people! The first line we got into was a booth that was serving “Possum Burgoo” I’m pretty sure they were trying to go for a traditional Kentucky Burgoo (which is amazing! ), so I figured if nothing else I would like the stew itself. This possum was incredibly life-like. The stew itself resembled chili. I got a huge chunk of meat in mine, which I bravely ate. It tasted exactly like chicken. In fact, I swear it actually was chicken because possums are kind of gross and I don’t want to think about eating them. The stew itself, however, was bland. After that I went into it with a new attitude: Food Critic. After the first booth, we got straight into line to try a squirrel meat rice dish. It was a little better than the Burgoo, but I was still searching for my favorite. The next line we got into had the best presentation, in my opinion. 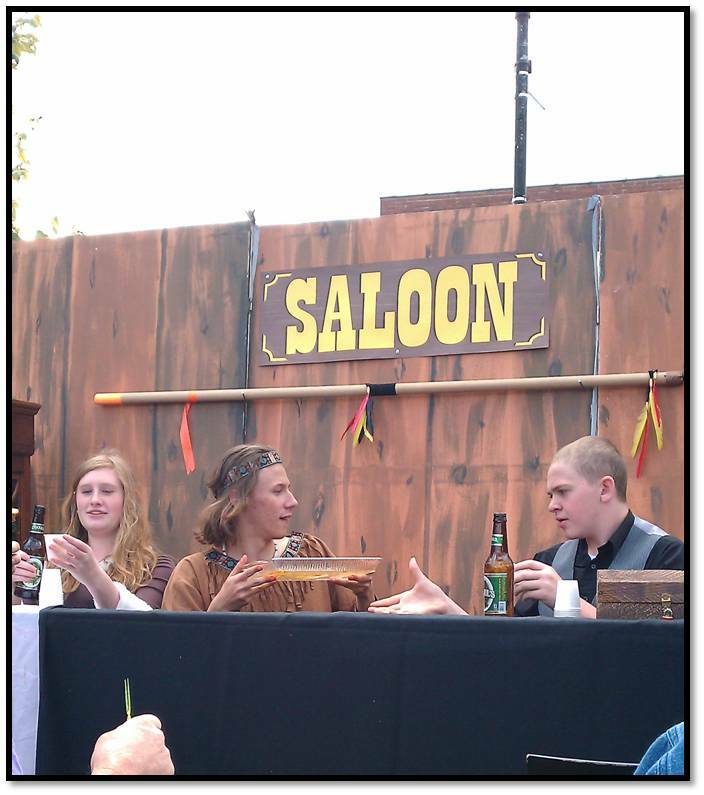 They were serving “Porcupine Quill” which was basically a skewer of porcupine meat (are porcupines typically roadkill?) with vegetables and a yummy sweet and a little spicy sauce. The boy in the middle said that Native Americans would use this recipe and use the porcupine’s quills as skewers for the meat and veggies. This was by far my favorite of the cook-off. They claimed to use the traditional Native American recipe, but it seemed a lot like teriyaki sauce. It was still delicious. After that, we tried a bear meatloaf, which I found to be a little mushy, but everyone else seemed to like. In case you can’t read that menu, they had a Teriyaki Venison, a Rabbit and Dandelion salad and Venison fried rice. Yum! I’m really sorry I missed that one. 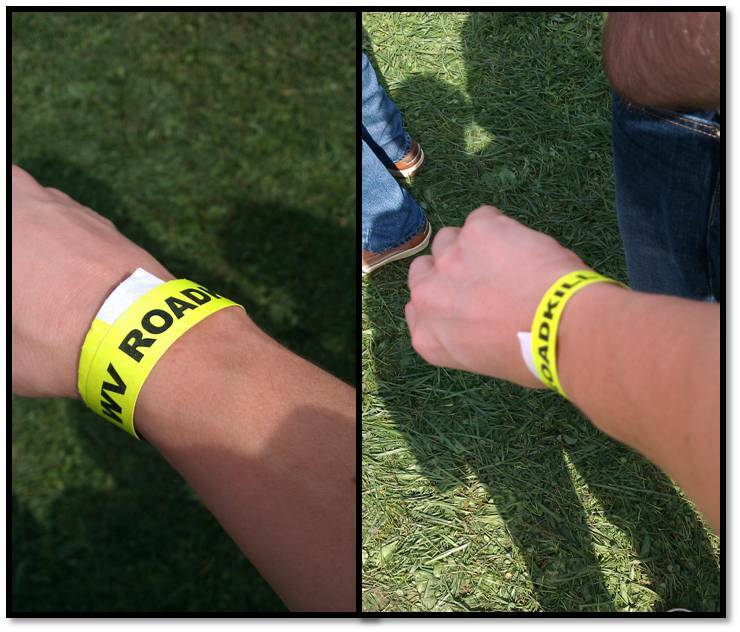 All in all, we thought the Roadkill Cook-off was just so-so. 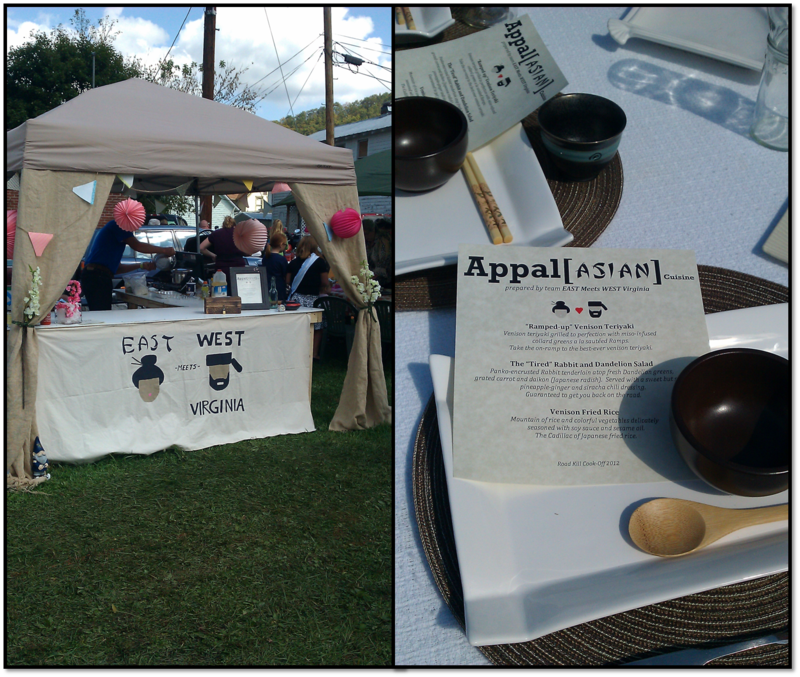 While the food was interesting and exciting, other than the samples of the food being judged, there wasn’t many food vendors around. There was a stand selling goat meat sandwiches (not my thing) and a stand selling Polish sausage (so my thing). Everyone got a goat meat sandwich, but when I went over to get a sausage they were out of onions and peppers so I passed. We ended up going to a restaurant and having a few bites there before heading back to the cabin for the evening. We got back to the cabin just as the sun was setting. I ran to the river to take some photos of the view, and I got the above gem. Despite the festival being kind of a bust, we had a great time hanging out, enjoying nature and each other’s company so the trip was a success! 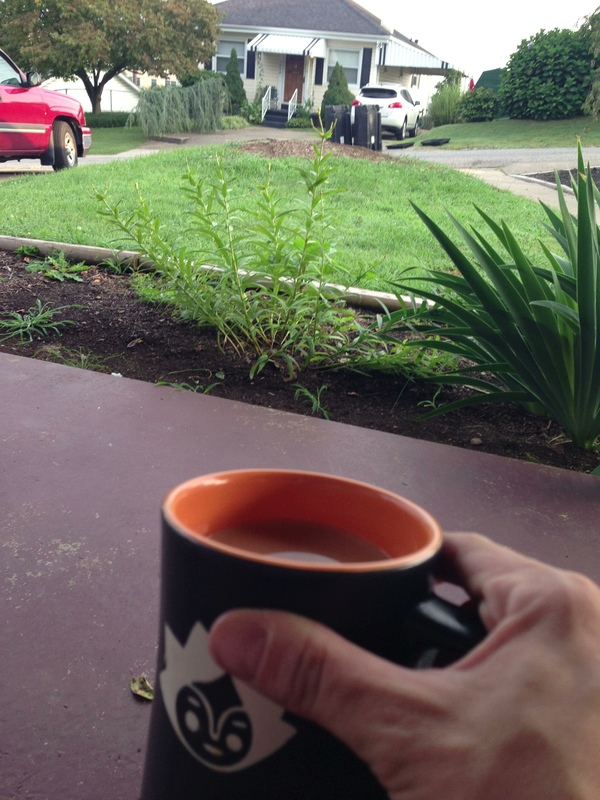 I had the best of intentions for this blog while I was on vacation. I was going to post a few times, filling you in on my awesome adventures. 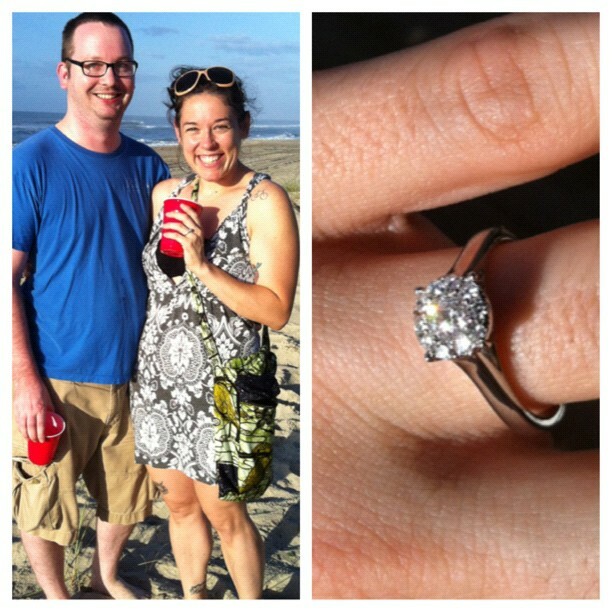 The vacation started off with a bang, with Zach asking me to marry him. After that, my goal to have a stress-free vacation was pretty easy, because I was floating on cloud nine. I’ve always assumed that Zach and I would get married, but the fact that he planned this all out and bought me a gorgeous ring made me feel incredibly special. Now, I get to plan a wedding! That’s actually not something I ever thought that I’d want to do, but recently the idea is growing on me in a big way. 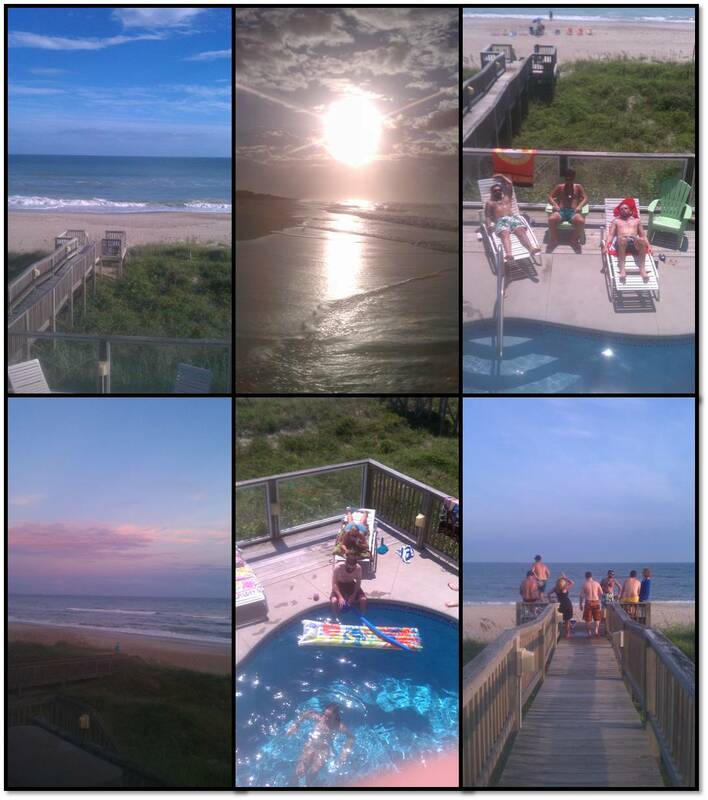 From top left, our beach, the sunrise, some boys lounging by the pool, sunset, more pool and our last evening at sunset. Since we’ve been back in town, the weather has been overcast and very humid. 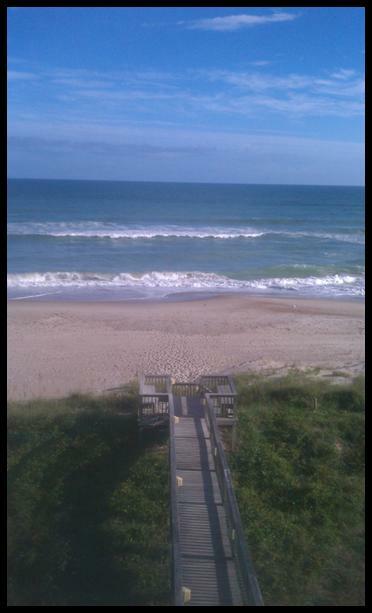 I think now that my beach trip is over, I’m ready for cool fall weather! Now, this is a health and fitness blog, so let’s talk about the elephant in the room: Weight Gain. I didn’t practice much moderation while I was away. I was happy and relaxed so I ate (and drank) whatever I wanted — and a lot of it. Resume counting calories: As we know, no amount of exercise will cancel out a poor diet, so my first goal is to resume counting calories using My Fitness Pal. I have been successful using this app in the past, but once you reach a comfortable weight, there comes a time when you have to toss out the calorie counter and go with your gut, so to speak. I’ve done that, it worked, but now I need to lose a few pounds so I’m back! Get back on my training schedule: This is going to be hard. Exercise is a habit, and once you break it, even for a short amount of time, it’s hard to get back on track. So I will make my training schedule for the rest of the week and I will stick to it. I will report my food and exercise here to be held accountable. Cut back on alcohol during the week: Since vacation was a bit of a drink-a-thon, it won’t kill me to stop drinking alcohol except on the weekends. Reduce sugar and grains: As we all know, this is a sure-fire way to lose weight. I’ve become quite accustomed to dessert, and I’m going to have to start subbing fruit instead. Greatly increase my strength training: Even though I only want to lose a few pounds, I’ve noticed some extra flab and even after I lose those 3 or so lbs of vacation weight, I want to gain some muscle. So I will devise a strength training plan that I will stick to for 6 weeks. I will post a plan here tomorrow. My comfortable, usual weight is 148 lbs. This morning, I weighed in at 151.7. Not terrible, and definitely doable. The main issue I have is that I have some flab, so the strength training in addition to my half-marathon training will help with that. What do you do when you know you need to lose a few pounds? Just a quick post from the road. We’ve only been driving for 2 hours (6 to go!) And I’m already going stir crazy. I do not like long drives! Zach is driving and my friend Ashley is riding shotgun. She just got back from 2 months in Uganda, and last night is the first time I’ve seen her. She promised that she will run with me at the beach. 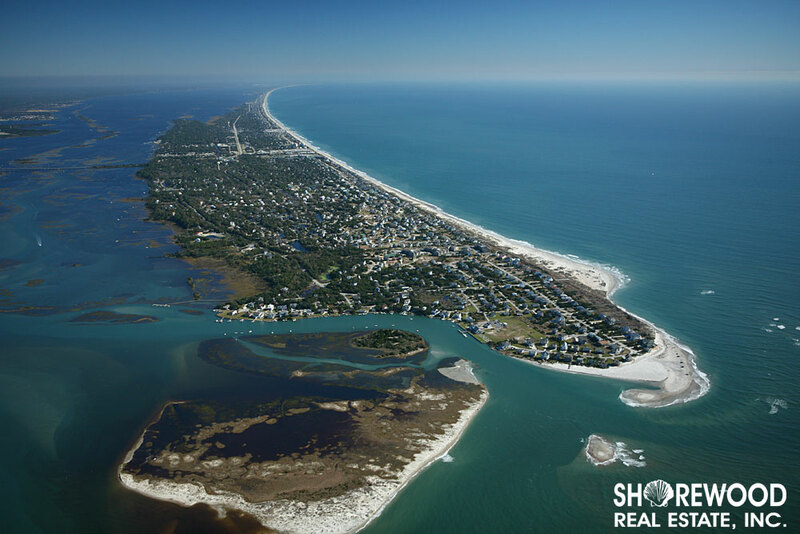 Our house is somewhere along that beach. That’s all I have for today! Hopefully the next blog post will be Sunday night, when I can share some real photos once I arrive. What’s the most beautiful beach you’ve been on? EQ Love Yoga Mat review! With vacation preparation and trying to tie up loose ends at work, I have had no time to use my brain for blog ideas! I need to keep the habit of blogging up, but it’s hard when you just don’t have much to talk about. I know this sounds self-centered, but I’m kind of the hub of my department at work (I wish my paycheck reflected that…), and I have a feeling they are going to need something from me next week while I’m gone, so I’m trying to make it super easy for everything to be located. That means this afternoon, I will be spending some serious time cleaning my desk from top to bottom. The thought of someone having to use my desk/computer/files and them being messy makes me cringe, so part of me being able to relax on vacation includes not worrying that my desk is a mess! Are you like that? I do have one thing to talk about today, so I overdid it with the photos. Yesterday when I got home from work, guess what was outside my door waiting for me? 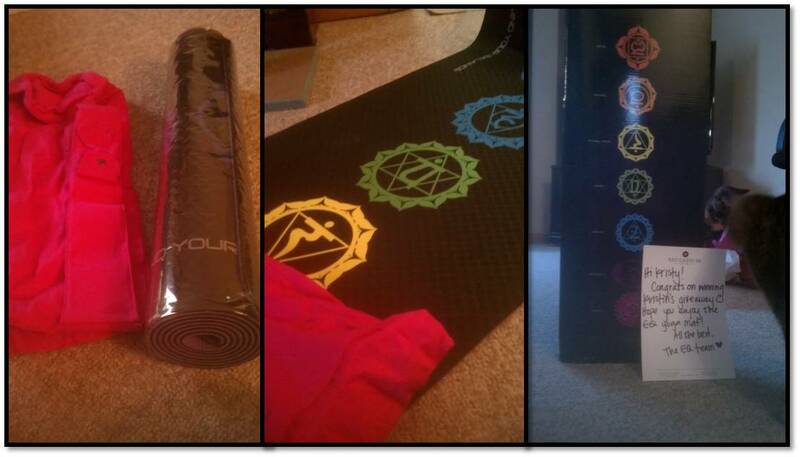 The EQ Chakra yoga mat that I won from Kristin McGee’s blog!! Man, was I excited. I didn’t even take off my work clothes before having a photo shoot with the mat and the adorable hot pink bag that came with it! This is the nicest yoga mat bag I’ve ever had the pleasure of owning. First of all, it’s the best color. I’m not much of a hot pink girl in general, but I like accent colors and this will go good with my mostly black and grey yoga apparel. It has tons of pockets, I don’t even know what I would keep in them all! There are mesh pockets at the bottom that can hold water bottles, and more pockets up the sides, maybe for your wallet or keys, and there is a nice sized cell-phone pocket on the front of the strap, for easy access. Finally, the bag is lined with silk, making it very easy to slide the mat in and out. After I did my photo shoot, I layed the mat out and did some yoga. Have you ever tried to photograph yourself while doing yoga? Not easy. I have some hilarious photos that will not see the light of day. Let’s just say forward bend is NOT attractive from behind. haha. Of course, I’m doing Kristin’s MTV Power Yoga DVD in this photo. The mat itself is great. It’s thick and sticky. The smell right out of the box was a little strange, but not nearly as offensive as the cheapo mats I’ve had in the past. It was more of a “new mat” smell, and I’m sure once I’ve used it a few times it won’t smell like that anymore. I used it on carpet, but the purple underside of the mat is textured and I can imagine wouldn’t slip on wooden yoga studio floors. I give this mat a great big thumbs up. I cannot wait to take it to a class! I might try to squeeze in the 8 AM Saturday yoga class at the gym, even though my Saturday schedule is already so packed. The EQ Love Yoga Mat isn’t available for sale yet, so I’m not sure how much it costs, but if you’re in the market for a quality yoga mat, I’d recommend it. A big thank you to EQ Love and Kristin McGee for the opportunity to try it out! You can read my stalkerish idolizing post about Kristin here. 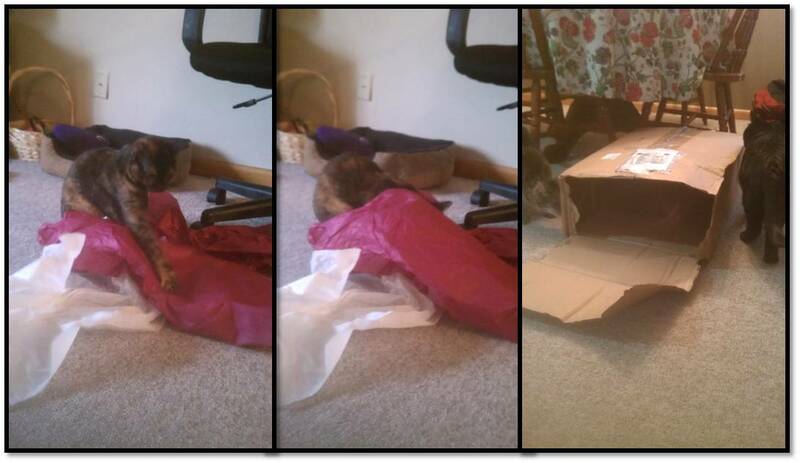 At one point I tried to throw out that big box and it was really heavy because there were two cats in it! Do you ever take yoga classes? Do you bring your own mat?